This week on Lake Okeechobee it has been very cold with the water temp in the morning starting at 58 degrees and by the end of the day warming up to only 62 degrees. But all is not bad, I have been going out around 10:00 AM and fishing till 3:00 PM with some good results. Flipping the hydrilla is the deal. Try to find the thickest spot in the grass. Don’t think you are going to get a lot of bites, but when they do bite it will be a good one. Here is a picture of my buddy Joe with a couple of fish we have caught this week. 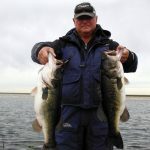 You can check the water level on Lake Okeechobee at www.okeechobeejust4bass.com.